The Battle of Spotsylvania Court House is a continuation of the Battle of the Wilderness. General Grant's decision to move forward to Spotsylvania changed the course of the war. For the first time in the Eastern Theatre, the Army of the Potomac went forward after a battle and maintained control of the initiative for the rest of the war. If viewed as one campaign, the Wilderness / Spotsylvania Campaign is the bloodiest in American history. The Battle of Spotsylvania, May 8-21, 1864, included some of the most desperate hand-to-hand fighting of the Civil War. The following describes the Bloody Angle: Along a 200 yard stretch of the Confederate line centered at what was called the West Angle of the Mule Shoe; soldiers struggled for 20 hours in the longest hand-to-hand fight of the war. Harris' Brigade of Mississippians and McGowan's Brigade of South Carolinians battled portions of the Union VI Corps. 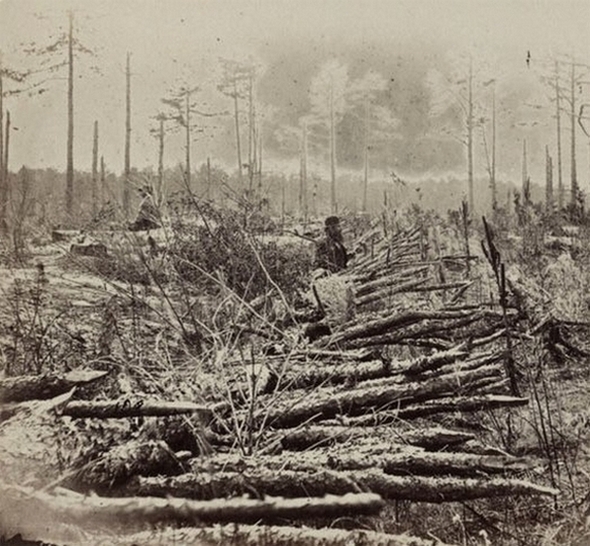 On May 12, Union and Confederate soldiers struggled over this ground for more than 20 hours, through pouring rain, producing unparalleled examples of both courage and carnage. Late on May 8, Confederate Edward Johnson's division, about 3.000 men, built an outer line of entrenchments. The "deflection" in the Southern line became known as the "Mule Shoe," or simply the "Salient." Confederate officers recognized the vulnerability of the position but, with the added support of over 20 artillery pieces, they felt the line could be held. On May 10, a preliminary Union assault, led by Colonel Emory Upton, met with limited success against the northwestern portion of the Salient. Upton's achievement prompted Union commander Ulysses S. Grant to organize a much larger attack. He massed a column of 20,000 troops; their objective: to carry the apex of the Salient. Peering through the morning mist in the predawn darkness of May 12, the Confederates caught their first glimpse of the Union attack. With an hurrah, the blue masses swept forward, first striking at the "East Angle." They quickly captured General Johnson and over 2,500 of his men, thanks in part to the absence of Confederate artillery which had been ordered away the previous evening. 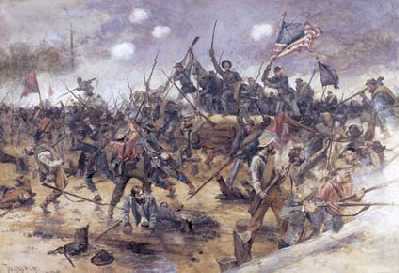 (Right) Artist conception of the fight at Bloody Angle during the Battle of Spotsylvania Court House. General Winfield Scott Hancock's Second Corps attacked across the open ground. The Northern columns formed along the tree line, and Union soldiers built trenches running parallel to the dirt road after the morning attack. Although one of the largest frontal assaults of the war, the attack began inauspiciously because commanding officers were not certain how to reach the Confederate works. After much initial confusion, General Barlow, overcome by the "absurdity of the situation," exclaimed to his guide: "For Heaven's sake, at least face us in the right direction, so we shall not march away from the enemy and have to go around the world and come up in their rear!" Battle of Bloody Angle, Spotsylvania Court House Battlefield Map. Courtesy Civil War Trust. During the savage fighting for the Bloody Angle, small ridges and swales provided some measure of protection from the steady storm of lead. Those who still survived now faced hours of harrowing combat at point blank range in a pouring rain. Confederate entrenchments near the Bloody Angle with abatis. LOC. (Left) The salient at Spotsylvania, May 10-12, 1864. 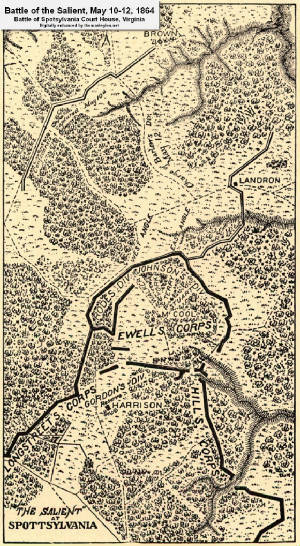 Map indicates the positions of the Corps of Longstreet, Ewell and Hill, and the charge of Barlow's Division on May 12. LOC. (Right) Civil War era photo of Confederate trenches fortified with abatis near "The Angle" at Spotsylvania Court House. LOC. Throughout the afternoon and well into the night, Yankee and Rebel fought each other with relentless determination. Nearby, a 22-inch oak, was shattered by the incessant musket and artillery fire. The outnumbered Confederates eventually fell back to a new line, and the battle of May 12 ended, but the fight for the Bloody Angle stood out in sharp contrast from other battles. Its terrible slaughter seemed to signal a shift in each side's perception of this great American Civil War. Never again would Lee have the strength to lead his men north; now, he fought to survive. Grant, too, left with a clearer, albeit brutal, image of the future. No matter what the cost, he would fight Lee's army until he destroyed it. Recommended Reading: Bloody Angle: Hancock's Assault On The Mule Shoe Salient, May 12, 1864 (Battleground America Guides). Description: On the morning of May 12, 1864, the site of the daring Union assault on the center of the Confederate line became the scene of the fiercest hand-to-hand combat of the Civil War, and thereafter was known as the "Bloody Angle." Da Capo's new "Battleground America" series offers a unique approach to the battles and battlefields of America. Each book in the series highlights a small American battlefield-sometimes a small portion of a much larger battlefield-and tells the story of the brave soldiers who fought there. Using soldiers' memoirs, letters and diaries, as well as contemporary illustrations, the human ordeal of battle comes to life on the page. All of the units, important individuals, and actions of each engagement on the battlefield are described in a clear and concise narrative. 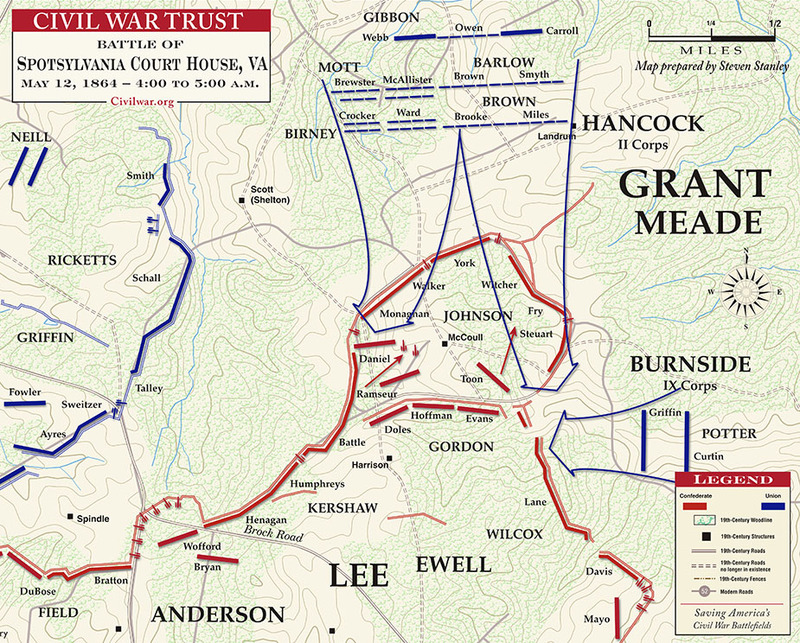 Detailed maps complement the text and illustrate small unit action at each stage of the battle. Then-and-now photographs tie the dramatic events of the past to the modern battlefield site and highlight the importance of terrain in battle. The present-day historical site of the battle is described in detail with suggestions for touring. About the Author: John Cannan has established a reputation among civil War writers in remarkably short time. His distinctions include three books selected by the Military Book Club. He is the author of The Atlanta Campaign, The Wilderness Campaign, and The Spotsylvania Campaign. He is an historic preservation attorney living in Baltimore. Recommended Reading: The Spotsylvania Campaign (Military Campaigns of the Civil War) (Hardcover). Description: The Spotsylvania Campaign marked a crucial period in the confrontation between Ulysses S. Grant and Robert E. Lee in Virginia. Waged over a two-week period in mid-May 1864, it included some of the most savage fighting of the Civil War and left indelible marks on all involved. Approaching topics related to Spotsylvania from a variety of perspectives, the contributors to this volume explore questions regarding high command, tactics and strategy, the impact of fighting on officers and soldiers in both armies, and the ways in which some participants chose to remember and interpret the campaign. They offer insight into the decisions and behavior of Lee and of Federal army leaders, the fullest descriptions to date of the horrific fighting at the "Bloody Angle" on May 12, and a revealing look at how Grant used his memoirs to offset Lost Cause interpretations of his actions at Spotsylvania and elsewhere in the Overland Campaign. Recommended Reading: The Spotsylvania Campaign: May 7-21, 1864 (Great Campaigns). Description: A very detailed examination of the Spotsylvania Campaign. A dramatic study of the campaign and the clash of the titans - Robert E. Lee against Ulysses S. Grant – and it is a book that you will refuse to put down. Continued below. Recommended Reading: If It Takes All Summer: The Battle of Spotsylvania (Hardcover). Description: The termination of the war and the fate of the Union hung in the balance in May of 1864 as Robert E. Lee's Army of Northern Virginia and Ulysses S. Grant's Army of the Potomac clashed in the Virginia countryside—first in the battle of the Wilderness, where the Federal army sustained greater losses than at Chancellorsville, and then further south in the vicinity of Spotsylvania Courthouse, where Grant sought to cut Lee's troops off from the Confederate capital of Richmond. This is the first book-length examination of the pivotal Spotsylvania campaign of 7-21 May. Sources: Fredericksburg and Spotsylvania National Military Park; Carruth, Gorton. "The Encyclopedia of American Facts and Dates". 10th Ed. New York: Harper Collins Publishers 1997; Map courtesy Civil War Trust; Library of Congress; National Archives.